Should Our Children Join The Armed Forces? | Virginia Right! Our country has always had the best and bravest military personnel, but we must now ponder if it is the right thing to do in joining under the current Administration. For many this could be the most important discussion and debate you have. The question is do we as parents encourage our children to join the Armed Forces under the current Commander In Chief, President Obama? For generations we have always believed it was a great honor to serve in the military, but now you must ask the question is it an honor to help an Administration that is hell bent on destroying our country? The above quote is repeated by Islamic scholars all across the world. They indeed mean it literally. I have been to mosques all over the world and there are more materials inside the mosque advocating this than there are any peaceful materials. I feel I can write about this topic because I served over 20 years honorably in the U.S. Armed Forces and held our country’s highest clearances. I was proud to have served my country. Today I feel compelled to write this article for the parents who have a son or daughter contemplating joining the Armed Forces. Most of us realize that after almost 4 years we have one of the most dangerous (in regards to our national security) President’s to ever serve as the Commander In Chief and possibly going to be in office another four years. I will go further and say our current President is hurting our country by not acknowledging that Islam itself is a serious problem to not only America but to the world. Obama will not allow his military officers to even remotely consider that Islam is a violent religion. 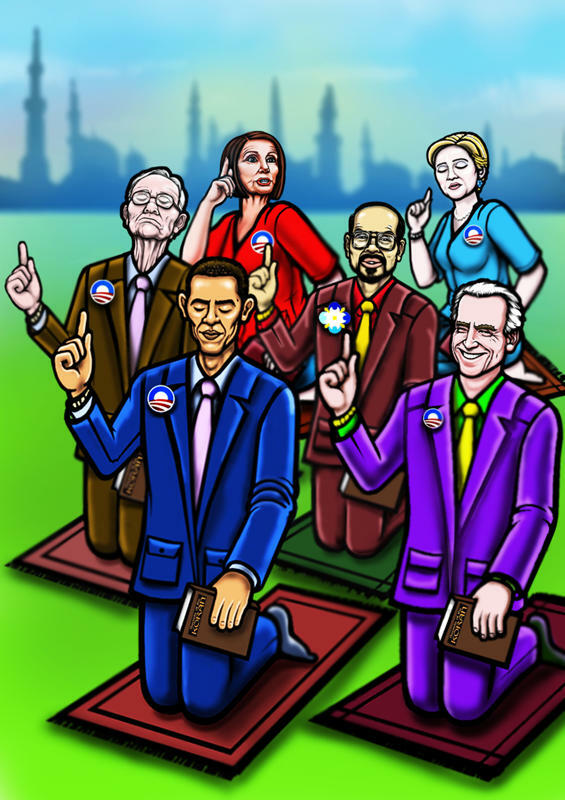 If Mufti Usmani and the hundreds of Islamic scholars all state that Islam’ goal is to establish the dominance of Islam worldwide over all other religions, why doesn’t Obama believe them? This is a question only he can answer, but the fact being he doesn’t feel the Islamic ideology is a threat to our country and therefore our children should not volunteer to serve under a Commander in Chief who doesn’t have our country’s best interest at heart and the best interest of our children. Parents should understand the primary reason for entering the Armed Forces is to protect our country, its people, and our way of life. The service member must be willing to give his/her life to protect these interests. If your Commanding Officer knowingly supports the interests of Islamic terrorist and their supporters then you must follow the orders of him or risk being court martialed. Currently we have senior U.S. military officers who have bought into Obama’s beliefs that Islam is not dangerous and there is not even such a thing as an Islamic terrorist. Obama will not allow the words Islam and terrorism to be used together. There has never been a time in our history that we have not fully identified the enemy when we go to war, until now. A country can’t expect to win a war if we have not identified an enemy. Obama feels Al Qaeda is our only real enemy. This is not even close to the reality. Of course Al Qaeda is a part of the enemy, but which part? The part is the Islamic ideology itself. Until we have a Commander In Chief who is at least going to look at this critical issue I discourage parents from advising their children on entering the Armed Services. As a parent would you encourage your child to go to work for a boss who has a proven track record of failures and who puts our country in a dangerous situation? Would you encourage your child to work for a boss who has friends such as Bill Ayers (Weather Underground Co-Founder)? Ayers and his group bombed several U.S. Government facilities’ to include Military Recruiting Centers. Would you encourage your child to work for a boss who had admitted using illegal drugs to include cocaine? Personally I would not. I will encourage my child to work for a boss who sets the example for the employees who work for him/her. The ultimate decision as to join or not join rests with your child when they officially become an adult. If they join under President Obama they may sacrifice their life for a policy that is harmful to our country and not beneficial. This is not heroic. Ponder carefully before making a decision. “The teaching of Islam is essentially a teaching for leadership and world warfare. One of its most important characteristics is that it teaches its followers how to acquire self-confidence without any taint of conceit and egotism, breathes into him the fervor of faith and conviction, free of all self deception, and, by weaning him from all independence on others, instills in him complete trust in God with a faith that never falters or grows weak”. ← SEVERAL STATES are TAKING ON AGENDA 21 and ICLEI! Dave raises a great point: Should we encourage our children to seek/serve in the military? I feel with all the feel good wars we are in or have been in (Kosovo, Iraq, Libya, chasing Kony, etc.) it is difficult to recommend the military for my kids. Some day we'll have a President like Ron Paul who will say, "Mind our own business, unless it is in the clear national interest and then Congress will authorize it." Welcome to Dave Gaubatz, our NEW blogger! I get it. Dave is discouraged and despondent. I agree with everything he has to say… to a point. We only have a few months to put up with this administration. We must encourage our young people to pick up the gauntlet and carry on with protecting this great country. We can never give up and resign ourselves to complacency. We are better than that. I thank GOPDiva. Good advise. If in a few months we have a changing of the guard (which I believe we will because I feel there will be record numbers voting) and I would highly, highly encourage our young men and women to join the military. If Mr. Obama does win, then our young men and women have a tough choice. Respectfully, Dave g.
Thank you, Dave. My words come straight from my heart. We both love this country. We WILL win in November and take our country back. We need to fall on our knees and pray for He is in control.